The Conservative Dilemma: Principles or Expediency? Many years ago I was faced with a very real dilemma. This dilemma involved my personal and very closely held principles on the one hand and my moral obligations on the other. It was the first time I had ever faced such a situation. Normally these two were one and the same. Not this time. You see I was at that age when young men face the call to go into the military. My personal principles said, and very strongly, that I should keep myself as safe as possible. I should not deliberately place myself in harms way. I was meant to live and live a happy healthy life with all of my faculties and limbs. Joining the military would put all of that at serious risk. Countering that was the moral obligation to serve the nation that fostered that safety and the freedoms that country gave me just because I was lucky enough to be born in America. At that time I was only peripherally aware of the struggle that brought about that nation. I had been taught a very real history of this nation. I had learned of the founding fathers who had pledged their lives, fortunes and their “Sacred Honor” to bring it about. I knew that most had lost the first two while keeping their “Sacred Honor”. But all of that was learned from books so I could pass the tests they gave me to write. It wasn’t all that real to me. Oh, I was raised in a family that held all of it dear. They were, what is now viewed as the old fashioned republicans. The fought the liberalization of their country. The were vocal in their angst regarding the liberal movement away from the Constitution and the Declaration of Independence. But again it was a nebulousity. Something of only philosophical importance to my young and know it all mind. Suddenly I was being forced to make all of it real. I did not realize it at the time, but I was making a decision about how I was going to live my life. Was I to be just another person that accepted what others were willing to give me or would I be a person that defended others and fought to keep the American dream alive. Not that I ever thought about it like that at the time. Well, I made that decision after some time. I swore the oath and wore the uniform. For the first time I put others ahead of myself. My moral obligation had won out over my personal principles and as a result, that obligation became my highest held personal principle. The two were now one. Now, here I am, almost half a century later faced with a similar choice, but one that is just as important. I fought the good fight. I vehemently opposed the Trump nomination run. I desperately wanted a constitutional conservative to make that run and God willing, win the white house. Trump was a very poor choice for that. Now I am faced with the dilemma of either lending my vote to this man I don’t really trust of of ceding the presidency to a woman I KNOW hates all that the constitution stands for. She is both a liar and a criminal and quite possibly a traitor in the very legal sense of that word. There are other choices on the ballot. The Libertarians have a good man the Constitution Party has a man that holds many of my beliefs. I can happily live with either in the oval office. The simple fact is that neither stands even the slightest chance of winning. The libertarians have never gotten beyond the one per cent vote level and the Constitution Party in a complete unknown to the voters. The only thing they can do is take votes away from the Republican and give the election to the Constitution and freedom destroying Liberals. It comes down to this: I don’t like Trump. He is not a conservative, but he does espouse SOME conservative principles and he does appear genuine in hi desire to keep America from becoming an Islamic state. He does appear to be a man that will do his best to enforce the laws of our country, for the most part. Hillary, on the other hand scares the living Hell out of me. For so many reasons. Again, the dilemma. 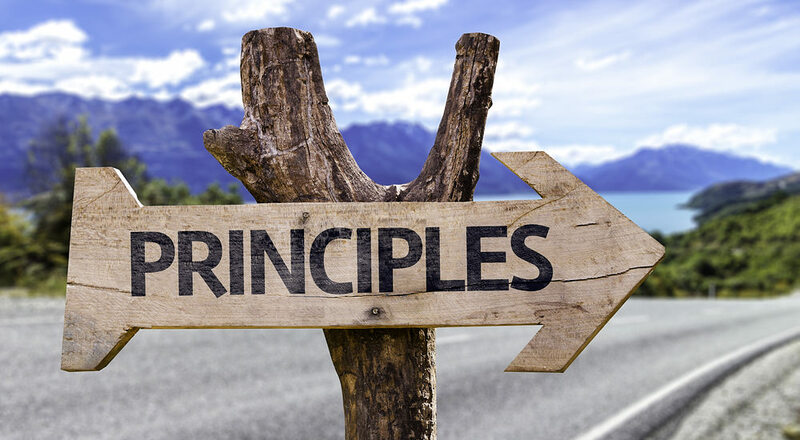 Principles or moral obligation? Again, I am forced to choose my moral obligation to keep the traitor out of the White House. I will vote for Trump and put my principles aside for the good of the country.